High power, emission-free driving. The plug-in hybrid SUV Audi Q7 e-tron and Mercedes GLE 500 e want to combine the best of both worlds: combustion and electric propulsion. First comparison test. That sounds like the perfect deal: plug-in buyers dispense with two cylinders in the combustion engine and get in return a partially electric car, all without sacrificing range or driving performance. A deal you cannot refuse, for sure. But wait, that’s not all. According to the current EU testing cycle, plug-in hybrids also offer the consumption of a moped. As an experienced consumer you will probably be suspicious. Well, for all non-believers, it is time for a quick fact check. In contrast to the conventional GLE 500 powered by a sturdy V8, Mercedes GLE 500 e uses a bi-turbo 3.3-liter six-cylinder engine with 333 hp, supported by a 116 hp electric engine mounted deep within the seven-speed automatic transmission housing, between the combustion engine and the gearbox. Together the two engines deliver an impressive 442 hp and 650 Nm. Thus, the economy variant should be in no way inferior to the eighth cylinder GLE. 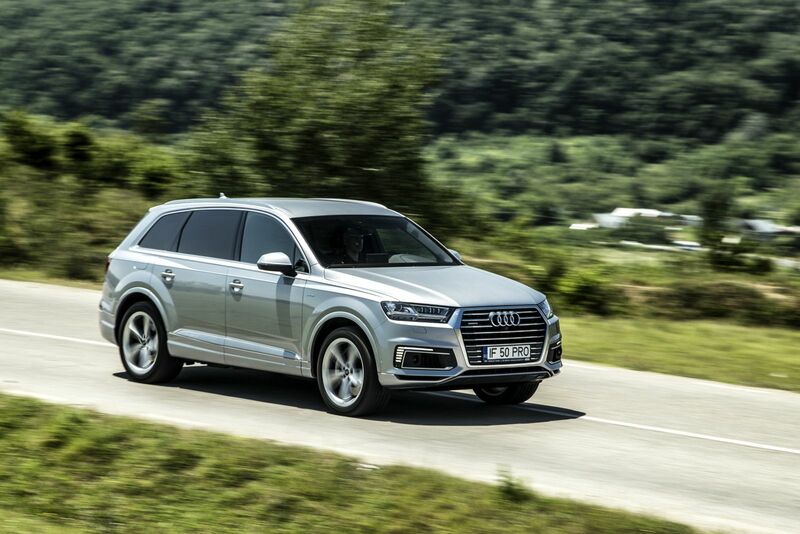 The drive train in the Audi Q7 e-tron, on the other hand, takes a slightly more original approach and combines a three-liter V6 turbodiesel with 258 hp and 600 Nm of torque with a 128 hp and 350 Nm electric motor, which is also housed in the eight-speed automatic gearbox housing. Despite it is the newer model here, hence its more advanced construction with the batteries mounted within the floor, under the rear seats, the Audi is in fact 55 kg heavier than the mature Mercedes. This weight surplus is justified by the heavier engine (diesel versus petrol) and, of course, the larger battery pack, almost double in capacity compared to the GLE 500 e: 17,3 kWh versus 8,8 kWh. This brings inherent advantages in terms of electric range, officially rated at 56 km for the Audi and 30 km only for the Mercedes. As expected, in real traffic, the battery empties much faster than that. 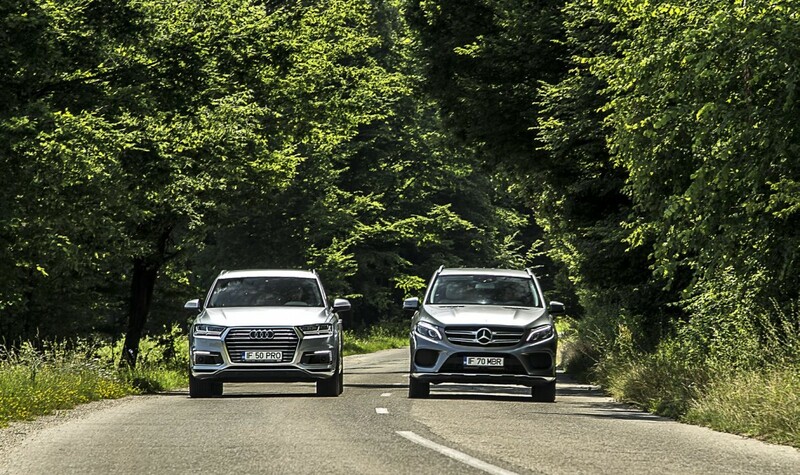 In our city test loop, the e-tron glided with zero emissions for exactly 34 km, while the GLE 500 e switched on its petrol engine after only 17 km. On national express roads, the range gap was eerily similar: 37 km for the Audi and 20 km for the Mercedes. The charging times brings out another peculiar aspect. When connected to regular, domestic sockets, the Audi can refill its batteries in 8 hours, while Mercedes announces 4,1 hours for the same operation. If both cars are connected to fast charging 22 kWh stations, the charging times are identical. How is this possible? Simple: if the Audi can sip 7,2 kWh of electricity, the Benz can only send 3,6 kWh to its battery pack. The two models also reveal their contrasting personalities when talking about the driving modes on offer. Mercedes can switch between the E-Save (freezes the current battery level), E-Mode (100% electric drive), Charge (the petrol engine drives the car while also working as a generator and charges the battery) and Hybrid (both engines work together or separately, as decided by the electronic brain of the propulsion system). Audi, on the other hand, can be driven in only three modes: EV (electric, similar to E-Mode from GLE 500 e), Battery Hold (conserves battery energy, again similar to E-Save from Mercedes) and Hybrid (both engines are ready to work, in tandem or alone). One particularity of Audi’s Hybrid mode is that this setting also allows the battery to be charged, so there is no other dedicated Charge program, like that of the Mercedes. At first glance, this seems to be a disadvantage compared to the GLE which can fill up its battery fast, after only 35-40 km running exclusively on petrol. But consumption rises equally fast in Mercedes’ case, and 3-4 liters of gasoline are easily burned to power the batteries back up to full capacity. Audi doesn’t make such wastes, but its battery also recharges very slowly in motion. In order to maximize the savings potential, the best way is to switch to the “Hybrid” (Audi) or “Hybrid” (Mercedes) mode and to leave the operating strategy entirely into the hands of the computer brackets. This works in both similarly unobtrusive and polished manners, which is why the desire for manual interventions is easily forgotten. In addition, the lowest consumption is achieved. However, the real world values have nothing to do with the fabulous values ​​of the NEDC standard. According to NEDC, the Mercedes needs 3.3 l / 100 km and the Audi a mere 1,8 l / 100 km, but the electrical energy is not taken into account. Both models are efficient as long as their batteries are fully loaded. Thanks to its bigger battery and more generous electric range, the Audi sips 4,27 liter of diesel for 100 km, as opposed to 6,15 liters of petrol for the GLE. Once the batteries are empty, the magic of plug-in hybrids is history and the mixed consumption figures go back up to their expected ranges: 9,17 l/100 km for the Audi and 11,20 l/100 km for the Benz. Surprisingly, the diesel Audi is also the quietest model here, with the Mercedes V6 bi-turbo engine’s sound being more audible inside the cockpit, especially as the acceleration pedal is pressed harder. Audi, the sportier car. Period. From a more emotional, dynamic point of view, the Q7 clearly trumps the GLE. Thanks to its lower center of gravity, the Audi feels more nimble, more connected to every need and desire of its driver. Both models offer adaptive settings for the engine, gearbox, steering and suspension, both models are supremely comfortable thanks to their (optional) air suspensions. But the devil is in the details. The Mercedes’ suspension tuning is much softer than that of the Audi, allowing the GLE to wave more longitudinally, not dissimilar to what you’d expect from a luxury yacht. The Mercedes is also more sensitive to short transverse joints. The Q7, in contrast, soaks up much more elegantly every pothole, big or small, and offers a more linear steering feedback – albeit still a bit artificial due to its electric setting. The Audi is slightly more rigid as well, not overtly so, also cornering more neutrally and with less lateral body inclination than the softer Benz. More powerful (333 hp), the Mercedes petrol engine is slightly faster and revs more keenly. This is hardly enough for victory, as the Audi diesel (258 hp) is almost equally fast, thanks to the superior, more intuitive (especially on downshifts) eight-speed automatic gearbox it is paired to. 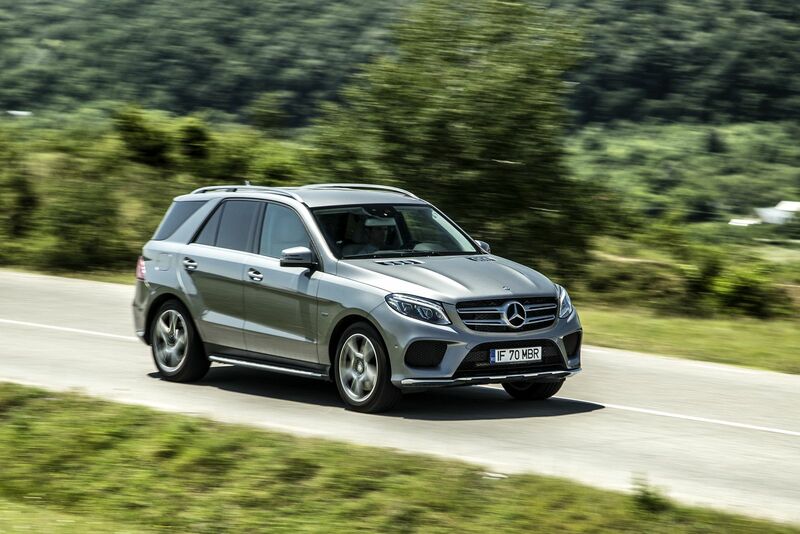 The seven-speed transmission from Mercedes certainly shows its age and it won’t be missed once the future nine-speed gearbox will be grafted to the next-generation GLE 500 e plug-in hybrid, due next year. The heftier torque also helps: Audi goes as high as 700 Nm, Mercedes is 50 Nm shy of its nemesis, at precisely 650 Nm. We left the more empiric discussion about space and comfort for the very end, despite the promising spots both models would deserve deep within the soccer mom consciousness. The Audi finishes first again, offering acres of space for all its five passengers, a consequence of the car’s more generous length (extra 24 cm) and wheelbase (plus 8 cm). Deal breaker: the Mercedes sees its battery pack perched on top of the luggage floor, eating up space and generating a huge loading gap once the rear seats are folded. These quirks are absent in the Audi. Built from the get go with a plug-in hybrid variant in mind, the Audi Q7 e-tron hides its batteries under the floor and, thus, boasts a practical, regularly shaped luggage compartment rated at 650 liters (240 liters less than in a conventional powered Q7), compared to a mere 480 liters (190 liters less than the GLE 500) in the Mercedes. 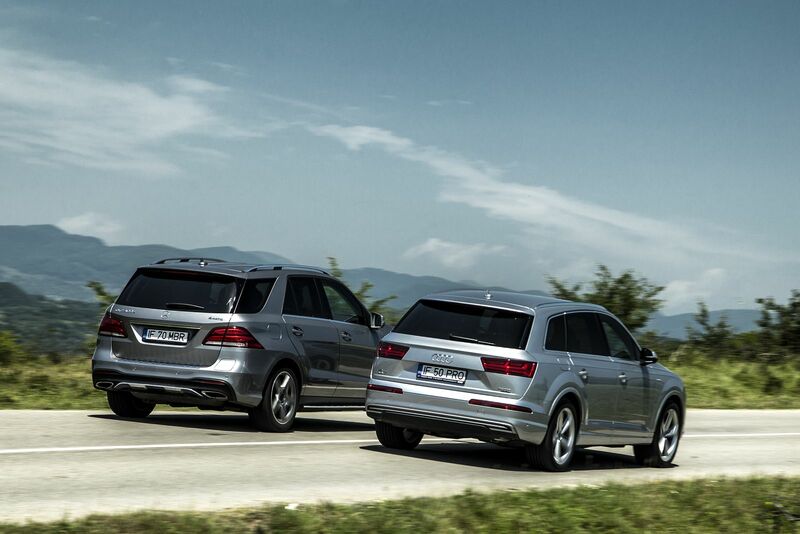 The driving position is lower, sportier in the less taller Q7. Ergonomics also score higher in the Audi, which pampers its driver with standard digital instruments, 12,3 inch in diagonal, and a swift-running, intuitive MMI multimedia system – rotary touch sensitive dial and 8,4 inch folding TFT central screen. The Mercedes is more archaic: 8,0 inch screen, old-school speedometer and rev-counter. Fit and finish is excellent in both cases with a small advantage (again!) for the Audi which is simply beyond reproach. After all the calculations and machinations, we can now lean back and take a long, hard look at the costs implied by the complex technology employed by the two plug-in hybrid luxury SUVs tested here. This is the only chapter where the mighty Audi is beaten hands down by the 7,000 euro cheaper Mercedes. The lower costs do not help the Benz achieve overall victory, though. Too many compromises, from the luggage compartment to the meager electric range and higher consumption, hinder its chances at ever becoming number one. Time to pass the torch to an all-new generation, then. READ MORE ABOUT THE ALL-NEW 2018 GLE HERE.